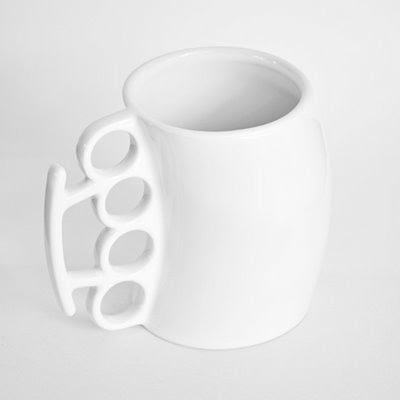 This coffee cup reminds you that getting up is hard, you need strong coffee and a good punch in the face to get going. 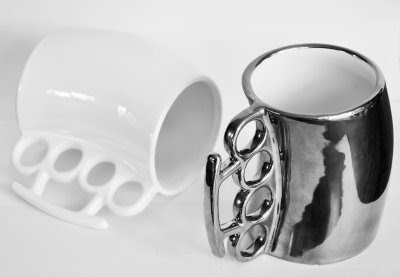 This cup is not for mobsters, gangsters or hooligans, we advice people to use this cup for coffee drinking purposes only. White Ceramic finish for beginners, silver coated for abusive users. No me wei qe son renders? Son de verdad, ya esta lista la primera serie limitada. Hay en blanco y en esmalte plateado. Ive been trying to buy this mug but cant find out where from. Could you let me know.